Eltronicschool. 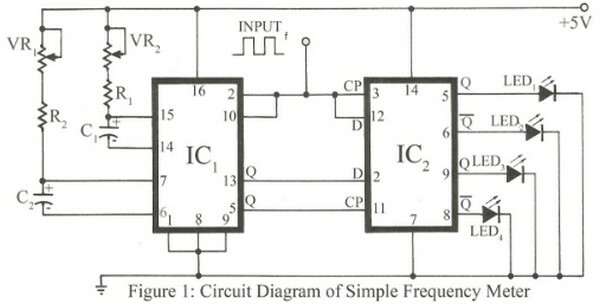 - This is of the instrumentation circuit schematic that called with frequency mater. The main component that used in this circuit are integrated circuit multivibrator dan D Flip-flop. In this time, based onD Flip-Flop, we will give you one of electronic circuit schematic of simple frequency meter like in Figure 1. below. Circuit schematic like in Figure 1 above is simple frequency meter. According Electronicsproject site describe that this is a simple frequency meter with which input frequency can be determined by simply measuring the values of two resistors and a little bit of computation. A retriggerable monistable multivibrator and a D flip-flop can form a simple, yet reliable frequency comparator that compares an input frequency with a predetermined reference. To determine whether an input frequency (f) falls between two known frequencies, f1 and f2, two one-shot/flip-flip combinations are used, as shown. Here both the one-shot and the flip-flop ICs are wired for positive-edge triggering. Each input pulse causes the monostable’s output to go high for the period of its preset timing interval. The flip-flop is triggered simultaneously, but its output is determined by the state of its D input at the time of trigger threshold. If the period of the input frequency is shorter than the preset timing of the monostable, a constant high level will be present at the D input, forcing the flip-flop’s Q output to remain high. If the input frequency period becomes greater than that of the monostable, the flip-flop’s Q output will go low.